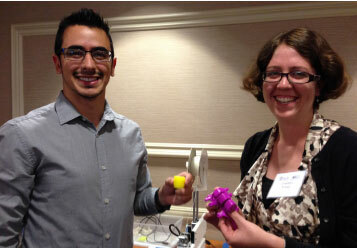 Enrique Daza, a PhD candidate at the University of Illinois Urbana-Champaign, and Courtney Young, a PhD candidate at the University of California, Los Angeles, show off their 3D printer project medical devices. Although they were fast learners, none of the students announced immediate plans to launch start-ups. But they did express abundant enthusiasm for both the new knowledge they acquired and the new network of friendships they made during the biotech course. That point was further underscored by Steve Casper, dean of the KGI School of Applied Sciences, who ran a session on Commercializing Science that set the stage for the rest of the course. Casper noted that although only 8% of available industry positions are in research, plenty of other positions need filling, in product development, project management, marketing and sales, business development, regulatory affairs, quality assurance, and other areas. In a world where only 8% of PhDs will get tenure at a university, preparing for a business career clearly makes sense for many scientists. That was the case for postdoc Nyasha Chambwe of the Institute for Systems Biology in Seattle, WA, who was drawn to the ASCB-KGI program because “I’ve always had an interest in business, and the business of science, but I’ve never had any training.” She learned a lot, she says, including the important fact that just discovering a new medicine isn’t enough. To make treatments available, an effective marketing strategy is necessary. Although the program offered a lot, Casper managed expectations. He informed the students that the one-week course would “not substitute for extensive management training,” such as students would receive in an MBA or Postdoctoral Professional Masters degree program. But, he said, it would introduce them to “the language and concepts of bioscience business,” using lectures on bioentrepreneurship, in-depth cases studies of problems typically facing bioscience businesses, and workshop-type breakout groups of small teams working on practical problems, such as whether to invest in a start-up. Despite its brevity, the program gave third-year graduate student Ahsan Choudary of the University of Texas (UT) Health Science Center in Antonio, TX, “an opportunity to collaborate with people from across the country and learn some great skills” that will directly impact his work in a consulting firm he co-founded, Commercialization Catalysts. The firm collaborates with UT’s Office of Technology Commercialization and has prioritized 20 technologies that the company believes are ready to go to market. “What I really liked about the course was the fact that we have learned hands-on techniques that we can take back home with us” in the areas of market sizing, intellectual property, regulatory affairs, and other topics taught during the five days. “All of that is going to prove very helpful,” Choudary says. Besides interactive academic sessions, students also worked in teams on a project using “Printbot” 3D printers. Under the guidance of Anna Hickerson, they used the printers to make medical implants for five diseases: infant tracheobronchomalacia, hip arthroplasty, genioplasty, shoulder osteoarthritis, and hyperscoliosis. Ten teams of five students each worked separately on assigned medical implants. They researched the relevant disease, its current treatment and market, and other matters necessary to make a decision about commercializing the implant. On the final day, they made presentations to panels of judges and recommended whether to invest in the 3D printable product. Two winning presentations were selected, with each winning team member receiving a large chocolate bar and cheers from fellow students. Every team received feedback. Two high-profile keynote speakers and two networking lunches with business professionals contributed to the students’ real-world knowledge of the bioscience industry. Speaker Art Riggs told the story about his work with colleagues in Genentech that led to the first successful expression of a human gene in bacteria and producing the hormone somatostatin. He described the collaborative process that led to the company’s success after near failure and responded to very active student questioning. Executive coach and consultant Judy Heyboer, formerly the senior vice president of human resources at Genentech, provided pragmatic and frank guidance on how to succeed in business careers. She shared the research finding that the key to successful teams is “nice people” and discussed the importance of good mentors. “The fact that the program presents a little bit of a lot of different things is the key for me,” says Vanessa Cox, a biochemistry PhD candidate at Georgia Institute of Technology. Having a consulting-type project to work on, together with case studies, as well as marketing and other classes, has been helpful, she says, providing not only academic knowledge but also personal insights regarding her preferences. “It’s confirmed where I’ll probably want to go”—into industry R&D as the foundation for a diverse career—Cox says. Likewise for Stanford University first-year biochemistry postdoc Darshan Trivedi, who wanted to know how science actually is commercialized, “This was a perfect venue” to be introduced to the key business concepts. “Now we know the jargon,” he said, and can basically understand what is happening when business acquisitions or other industry events are reported. Trivedi noted that scientists often feel they will be looked down upon if they join industry, but “that’s where a lot of things are going now,” and taking the ASCB-KGI course “will certainly make you more saleable” to companies. 1Kolata G (July 16, 2016). So many research scientists, so few openings as professors. The New York Times. http://nyti.ms/2cA4cSu. David Clarke is a Washington DC-area freelance writer with more than 20 years' experience covering scientific, environmental, and energy topics as a journalist, senior policy advisor, and consultant. He has a B.A. in Technical Writing and an M.A. in Government and Public Policy from Johns Hopkins University, Zanvyl Krieger School of Arts and Sciences.